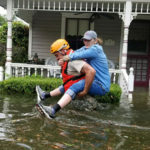 ASCE members in Texas are sharing their experiences as the region contends with the aftermath of Hurricane Harvey. The Texas A&M ASCE Student Chapter is one of many groups who have already organized relief efforts. The students are collecting supplies to send to hurricane victims. ASCE Fellow Stan Caldwell, P.E., SECB, F.AEI, F.SEI, lives in Plano, TX, 250 miles northwest of Houston, where – oddly enough – it’s been unseasonably cool this week with sunshine and no rain. The pleasant weather has made Plano and nearby Dallas strongholds of the Harvey relief effort. “Dallas has taken in about 1,500 evacuees so far and has been told by the state to prepare for up to 10,000 more. Similar directives have been given to Austin and San Antonio. The problem is that the roads in and around Houston are mostly impassable. Once the evacuees get here, they will likely stay for several months, or more, as Houston and the entire Gulf Coast face a recovery that is expected to take years. “All of Texas quickly mobilized for the storm. Plano, for example, sent 19 first responders, two fire trucks and a rescue dog. 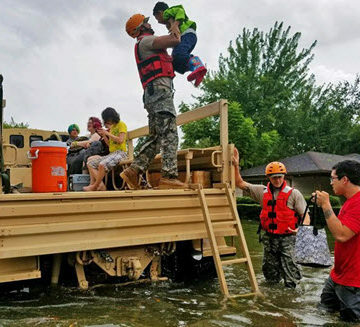 Many citizens hauled their boats down to Houston to rescue hundreds of people. Collectively, they are being called the Texas Navy. The Red Cross also does its staging from Dallas. They have a local affiliate that collects and sorts donated clothing, food, etc. The line of people making donations has been more than two blocks long for the past several days. “Unlike Katrina, Harvey has flooded rich and poor alike. River Oaks, the most exclusive and expensive neighborhood in all of Texas, is under water. This video from a local Houston TV channel, filming in another affluent area, shows million-dollar homes flooded to the second story and heavy-duty military trucks completely submerged in the street. “I live in the capitol city of Austin where we are dry by comparison to coastal cities, receiving just under 10 inches of rain since Hurricane Harvey made landfill Friday evening. Harvey initially struck Texas approximately 200 miles south of Austin, in the small fishing town of Rockport. Rockport is known as a sportsman’s paradise, and I fear it will take years for the city to regain its title, after seeing the heart-rending images of structural damage and boats cast aside like small children’s toys in the wake of Harvey. 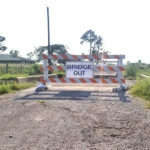 “I’ve been tracking rainfall and river gauge data since Friday evening thanks to continuous monitoring provided by the Lower Colorado River, Brazos River, and San Jacinto River Authorities. They report rivers rising more than 20 feet above their respective flood stages within the timespan of one to two days. San Jacinto River discharge rates – near Conroe, TX – increased by several orders of magnitude, peaking at more than 100,000 cubic feet per second (cfs). The SJRA’s database indicates the river’s median daily discharge, over the past 44 years, is slightly more than 20 cfs. “I repeat: discharge rates increased from 20 cfs to more than 100,000 cfs in a matter of days. I can’t begin to imagine what that increase looks like in person, but with drone technology readily available, the video footage posted online is jaw-dropping. Note, the Federal Aviation Administration has requested individuals refrain from flying drones to allow first responders to do their jobs. 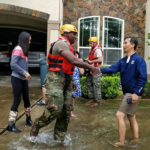 “Having a daughter in Houston and a nephew and his family, we have been dealing with some personal effects of the storm, but they pale in comparison to our other Texas brothers and sisters. I can only say that I am very proud of Houston and of our state and the way they have responded. “As civil engineers, particularly in the area of transportation infrastructure, we all need to be ready and willing to do what we can, including and especially, in providing our expertise when and where it is needed without expectations of any personal gain. I, along with several other ASCE members are a part of the FEMA US&R (Urban Search and Rescue) system, with the role of Structures Specialists. My role in Hurricane Harvey is to be a structures specialist with the IST (Incident Support Team, which is the US&R leadership component), and the others are members of the various task forces. All 28 FEMA task forces are engaged in one capacity or another, as are all Texas FEMA and State task forces. Eight are complete task forces, seven are partials and the other thirteen have the “Mission Ready Packages- Water” which are limited “boat” teams. 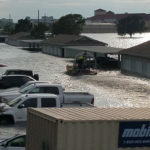 Our mission is to support the local efforts…so far we have extracted approximately 4000 individuals in rescues and evacuations and we are in the process of assisting the local fire departments in completing searches of all dwellings, businesses and vehicles that are in the damaged/flooded areas. The US&R leadership is amazing to this engineer in working with the locals to identify needs and place our assets where they can do the most good.